Finally. A collection worth everyone’s time. Rahul Mishra ICW 2018 fashion show showcased some amazing Indian Wear. There are outfits for the groom, bride, brides sister as well as for the bride and grooms parents. Personally, I found this collection to be right at the top this wedding fashion week season. We have seen some amazing designer collections, but this one is special. Scallop borders have been trending since last season. I love the look. I think it has Pakistani influence to it. But who doesn’t want to dress up in new bridal designs? This gorgeous red bridal lehenga by Rahul Mishra is traditional yet having some modern feel to it. The beautiful border work with the big motifs is a unique style to pick for your wedding day. 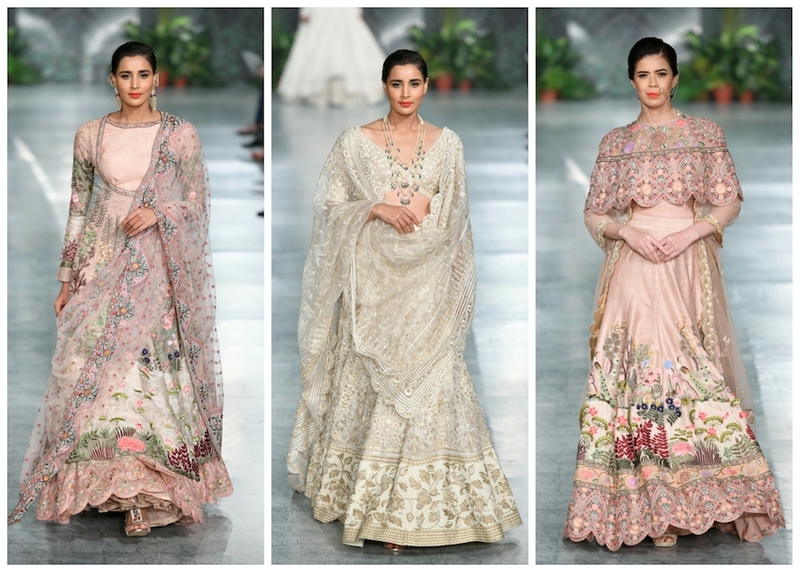 Probably these two bridal lehengas above have to be my favourite from this collection. The colour is so fresh and with the flora-fauna detailing, super duper pretty isn’t it? I mean, I am not really sure if as a bride I would pick this over the zillion other options, but the design is definitely eye-catchy. Take a moment to just notice all the detailing on these lehengas. The cape style blouse comes with a sheer net jacket/dupatta? I am not entirely sure what it is. But oh so pretty!! There is something almost architectural in the motifs and designing of these beautiful garments. One can see windows, gardens, flora fauna all done in perfect synchronization with the rest of the lehenga design. Inspired by the Mughal era, these gorgeous work of art is every bit an investment and worthy of it if I may add. Now to be fair, I am not saying these lehengas are for mother of the bride only. A bride herself can go for these especially the one above in ivory gold. I’ve always maintained a stance that brides mothers are super duper important in their daughter’s wedding. If there is one person who deserves to shine through, it’s the moms. Hence, I think these beautiful creations are every bit a stunner piece for moms to adorn on their single proudest moment. Mehendi being a fun colourful event, this gorgeous mint green lehenga with floral detailing is perfect for your first wedding function. One can find similar lehengas in his previous collections as well. So I do have some fair idea about the price range of Rahul Mishra Lehengas. P.S. You will need to scroll down to see that. The 17th century Mughal architecture inspires us significantly for the extensive explorations done at the time, in the use of floral motifs and mixing of local art forms. The relatively less known Asif’s Khan’s tomb featured some of the finest examples of complicated architectural details in the form of stalactite vaults at the roof of its entrance portals and the internal dome. Who else is in love with this saree blouse with a cape on top style? Pretty stylish, ain’t it? You can reuse the cape separately with loose pants, lehenga skirt anything. It is such a versatile garment to own. The saree on its own though looks fabulous as is. These sarees are technically not bridal. But perfect for wedding guest looks. There are some which are gorgeous. You can include them in your wedding trousseau or even gift to your mum-in-law.